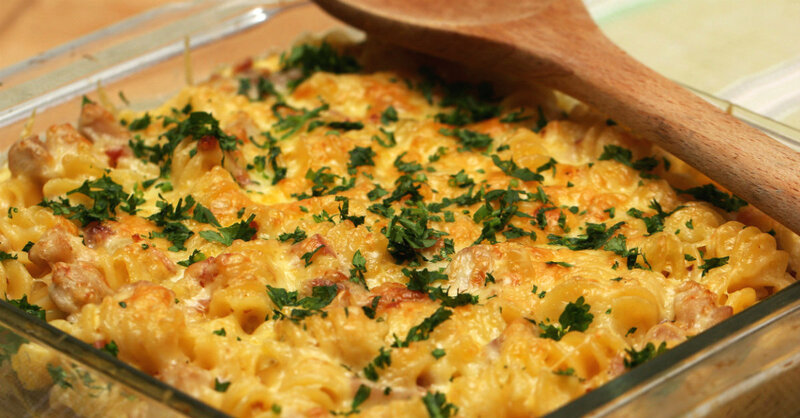 With Chicken, Bacon And Cheese, This Pasta Has Everything You Want!! What can we say: when it comes to food, we know what we like and, in this case, we wanted to showcase some of the classics, bacon and chicken (and cheese). You basically can’t go wrong with any pasta, but this one is jam-packed with all of the above flavors, plus it’s insanely creamy, due to our addition of condensed cream of mushroom soup; the soup lends itself perfectly to this dish because the mushroom flavor is subtle and doesn’t overwhelm the other flavors, and it simultaneously thickens the sauce and creates the perfect backdrop for the rest of the ingredients. We can’t get enough of this and we’re pretty sure you’ll feel the same once you try it! Preheat oven to 400º F and bring a large pot of salted water to boil. In a large skillet or Dutch oven over medium-high heat, cook bacon until just crispy, then transfer to a paper towel-lined plate to drain. Discard all but 2 tablespoons bacon grease and return pan to heat. Sauté onion until softened and translucent, 6-8 minutes, then add minced garlic and cook for another 1 minute, or until fragrant. Season generously with salt and pepper. Reduce heat to medium-low and pour in mushroom soup and heavy cream. Add in chicken and stir to combine. Once everything is combined, mix in mozzarella and cheddar cheese and stir until melted, then mix in pasta. Transfer pasta and sauce to a large baking dish and top with crumbled bacon. Sprinkle parmesan over the top of pasta, then place baking dish in oven. Bake for 20 minutes, or until sauce is bubbly. Remove from oven, garnish with chopped parsley, serve and enjoy!